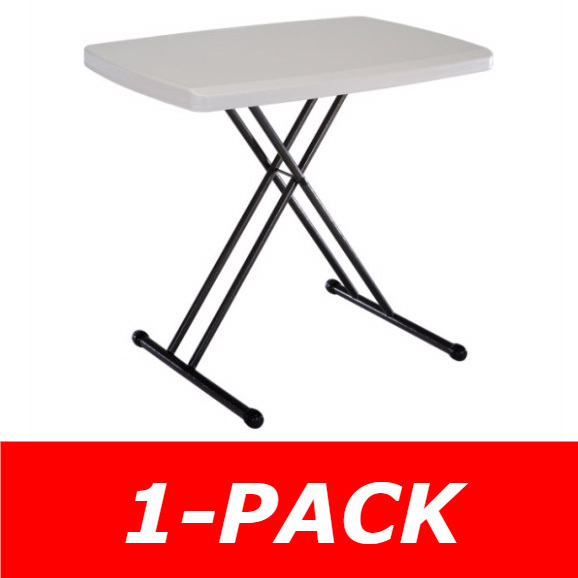 Height adjusts to 21, 24, 26 and 28"
If you need multiple adjustable personal folding table units, consider our lifetime personal table 8240 (40 Pack of folding personal tables) and 30 inch Almond Personal Table (52 Pack) which offers free shipping. 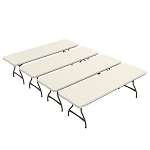 Lifetime Personal Tables are constructed of high-density polyethylene and designed for strength and stability. Product features four adjustable height settings from 21" to 28" for versatile use. The small plastic folding table steel frame design folds flat for easy storage and is protected with a powder-coated, weather-resistant finish. 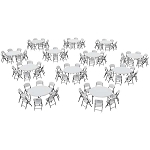 Small Lifetime round tables are built for indoor or outdoor use and are backed by a two-year warranty. Lifetime Personal 30" Table Adjusts to 21", 24", 26", and 28"
Lifetime Almond Personal Table with Folding Legs is Ideal for Home, Office, Crafts, and can serve as a card table! Lifetime 30" Personal Table is great for Outdoor Activities and More! What is polyethylene and why is it better than wood?" Polyethylene is a plastic that is virtually indestructible. It will not chip, crack or peel like particleboard laminates. Powder coating is the process in which a bare metal object is coated with electro-statically charged powder. It is then baked at a high temperature. Powder coating is the most durable coloring process on the market. It is better than traditional paints. "Will my Lifetime Tables Personal Tables adjustable legs rust on the 28240 small plastic table?" All metal will eventually rust. 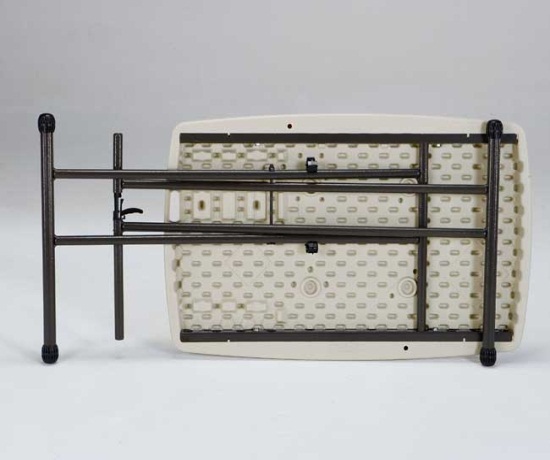 However, you can reduce the effects of rust through regular maintenance and having a powder-coated finish. "What are the advantages of a hammer-tone finish on adjustable small folding tables?" Hammer tone is a textured powder-coating finish that is better and more durable than smooth powder coating. It is resistant to scratches and flaws. 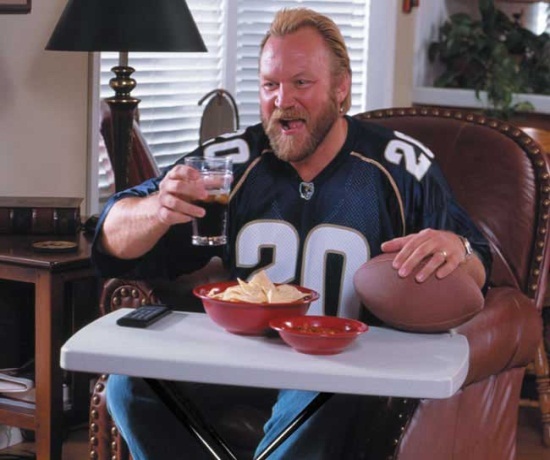 "What maintenance is required for the metal frame on the Lifetime 20" X 30" Personal Folding Table?" With the powder-coated protection, very little maintenance is required. However, checking your metal frame for excessive scratches from normal wear and tear is recommended. Repair rust spots or scratches by sanding the affected area lightly; using a rust-preventative spray primer; and finally, spraying with a high-gloss spray enamel paint. "Will the adjustable folding table top fade outdoors?" All products left out in the sun for extended periods of time will eventually fade. However, these products have UV inhibitors that help prevent fading and maintain the integrity of the polyethylene when exposed to sunlight providing years of color. "Will the Lifetime folding table 30 inch top stain?" Even the toughest of stains such as red punch, permanent marker, mustard and motor oil could not stain the tabletop on these card tables. "How do I clean the Lifetime 30" almond folding personal table?" The only products you need to clean it with are a damp cloth and mild dish soap. For tougher-to-remove dirt, use a mild abrasive such as Soft Scrub and a soft-bristle brush. "What are some of the advantages the small Lifetime table portable unit has over wood versions?" They provide many advantages wood tables just cant offer. Polyethylene is more durable, easier to clean, and lightweight. It will not crack, chip or peel and is ideal for indoor and outdoor use. The rounded edges will not cut your hands and provide a great handle for carrying. They are also more attractive than wood tables. 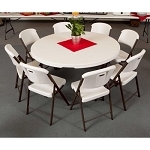 View our other Lifetime Utility Tables, Lifetime tables, Lifetime chairs, and Plastic Tables. Competitive Edge Products, Inc. is an authorized reseller of Lifetime Products, Inc. from Clearfield, Utah 84016. Awesome, well built in USA table. Fits my needs perfectly. Very satisfied. Excellent tables. quick shipping ... nice transaction. My job moved, and the office I have do not have a lot of space. I needed a table that would fit in a small corner. This table is perfect! This is the perfect table if you do not have a lot of space. I am thinking about purchasing one for my apartment also. Excellent small folding table. This table is very easy and convenient to use. I carry it around in my open truck bed all the time for several years now and its stood up to all kind of weather and physical abuse and still works great. 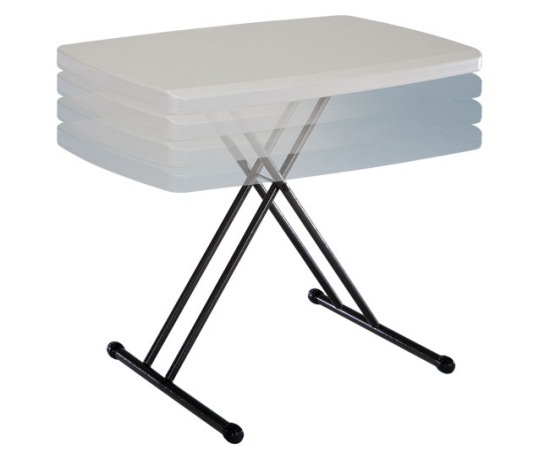 I would definitely recommend this product to anyone that has a need for a small folding table. I have been very happy with my purchase. This is a great sturdy table to hold our road mixer for concerts, and the height adjustment works great. We usually cant find a sturdy enough small table when we travel because the mixer is quite heavy with all of our wireless devices in it as well. Stands up and takes a beating! This little table has been invaluable as an eldercare accessory in a skilled nursing care facility with barely room enough for the resident. When a TV stand was needed, there it was. When it was time for a snack, or a game of Scrabble or cards, it was the perfect size for two. At Christmas it became the tree table. When the nurses needed extra room to set medicine or supplies, it filled the bill. It has held plants, flowers and cards; served as a coffee table for visitors; and all sorts of other things. When it needed to be out of the way, it was quietly tucked into the corner waiting for its next command performance. Its light weight, ease of assembly, compact size and height options make it so versatile. A definite MUST! personal table rocks, I throw it up in any room I am in, I used it for studying, and now its great for crafts. I have grand kids and when they come over I get it out for them to color on. Q: What is the closed length of the table? Q: How much does this weigh? A: The table weighs 11 pounds. Q: Can I put hot appliances on it? A: Depends on how hot and how long. The top is plastic and can melt so I wouldn't recommend leaving hot appliances on it. Q: Will I be able to draw on it? Is it bumpy or just smooth? A: It is smooth and yes you would be able to draw on it. Q: Mine is wobbly on carpet what should I do about it? A: the higher you adjust any table the more top-heavy it becomes and the more wobbly it can become. If you have an exceptionally sick carpet it may even be unusually wobbly. If you are using this as a craft table and want to minimize any wobble you might consider putting down an office chair mat or plywood-something to give you a solid surface. Q: How portable is this? Could I put it in the back of the trunk? A: It folds of flats and could definitely fit in the trunk of a car. Q: What colors does this come in? A: This comes in white granite colors. Almond is a light beige. This personal table ships via FedEx for a doorstep delivery. No signature required Fast Shipping! Orders generally leave the warehouse within 1 business day. Dimensions: 48" x 20" x 3"